The OUHSC strategic plan for research targets and builds upon existing research and clinical strengths to achieve a healthier future and vigorous economy for Oklahoma. The key areas of research targeted are cancer, diabetes, neuroscience/vision and infectious diseases/immunology. The OUHSC already had a solid core of basic and clinical researchers in these four areas, plus the largest biomedical infrastructure in the state. Through recruitment, the OUHSC continues to grow its ranks of top researchers. Research at the OU Health Sciences Center has led to the development of several Oklahoma companies, including Caisson Biotech, which just entered into a development and license agreement with Novo Nordisk, representing a total deal value of potentially $100 million, as well as Altheus, Biolytx, Inoveon, Nantiox, Pure Protein, and Selexys, located in the University Research Park. Other companies at the Research Park such as Urocor, Charlesson and Genzym have had or continue to have close association with active research programs at the OU Health Sciences Center. 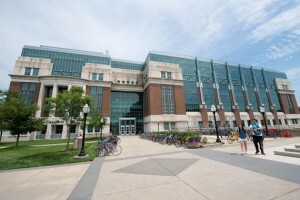 The research enterprise at the OU Health Sciences Center also provides training for undergraduate and graduate students who will continuing economic growth in the state.